Human nature is nothing if not consistent. I’ve seen this dozens of times. At every single intermediate cycle low traders begin to doubt. No matter how strong the bull signals are, when a correction occurs traders find, or make up reasons for why the bear market is still in force or a new bear market is starting. Folks, bull markets have to have corrections. They don’t signal the end of the bull, they are just profit taking events when price gets stretched too far above the mean, or when sentiment becomes too bullish. 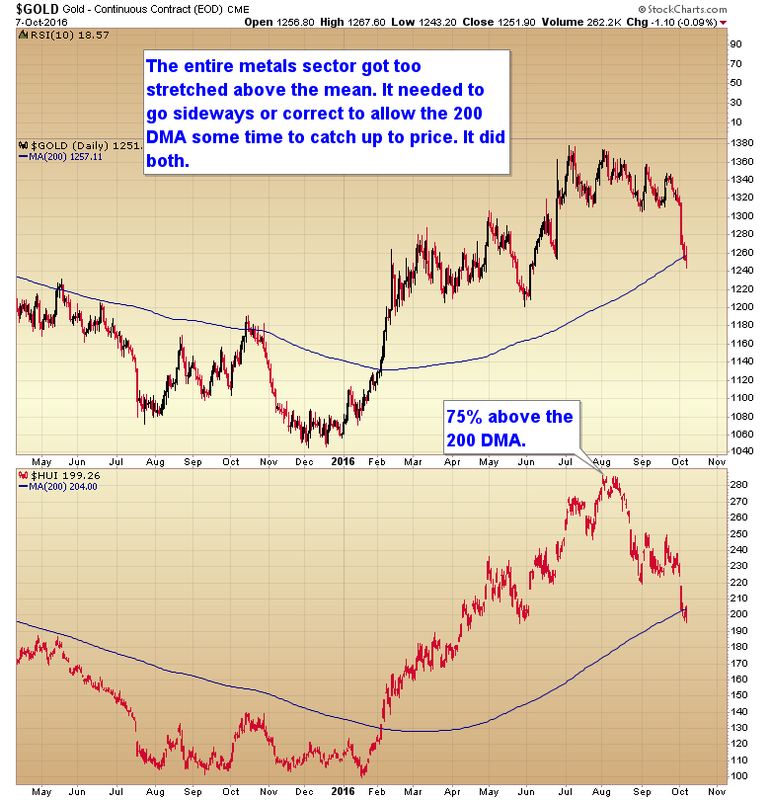 A couple of months ago I warned that the metals would need to either correct, or trade sideways for a while as the entire sector had just gotten too stretched above the 200 day moving average. Well as it turns out it did both. It churned sideways for 3 months and then corrected as well. This isn’t the end of the rally though. The metals just needed a profit taking event to cleanse the sentiment after the baby bull rally. That rally delivered a 180% gain in mining stocks. Seriously, after a rally that big there had to be some kind of correction. 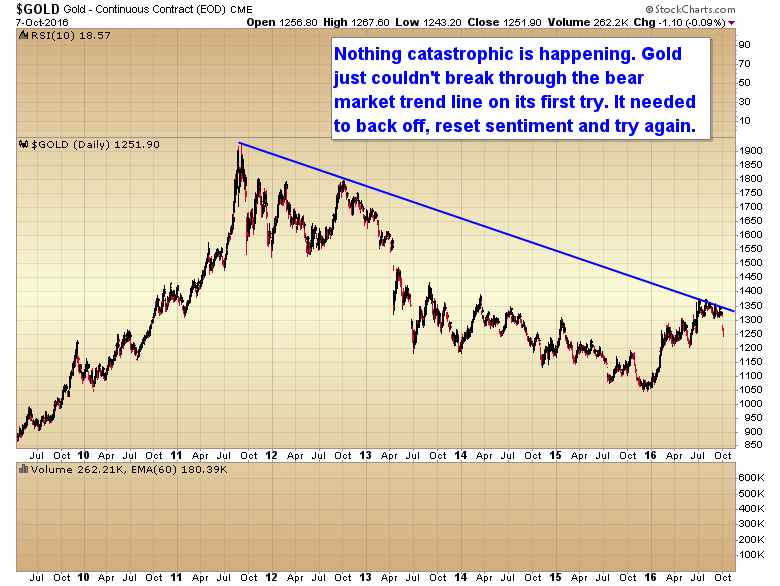 Gold also rallied enough to test its bear market trend line. Not surprisingly it didn’t make it through that on the first try. On the long term chart you can see that gold is just backing off to catch it’s breath. Nothing unusual is happening. Once the correction is over then gold will make another run at that trend line, and this time it will break through. Now we are coming to the end of the correction. Sentiment has been reset. the 200 DMA has had a chance to catch up to price, and gold should be ready for the next leg up in this new bull market. As I’ve noted before the bloodbath phase of an intermediate degree correction usually lasts 4-7 days. Friday was day four. If the bottom didn’t form on the employment report Friday, then I’m going to say it will form by Wednesday of next week. 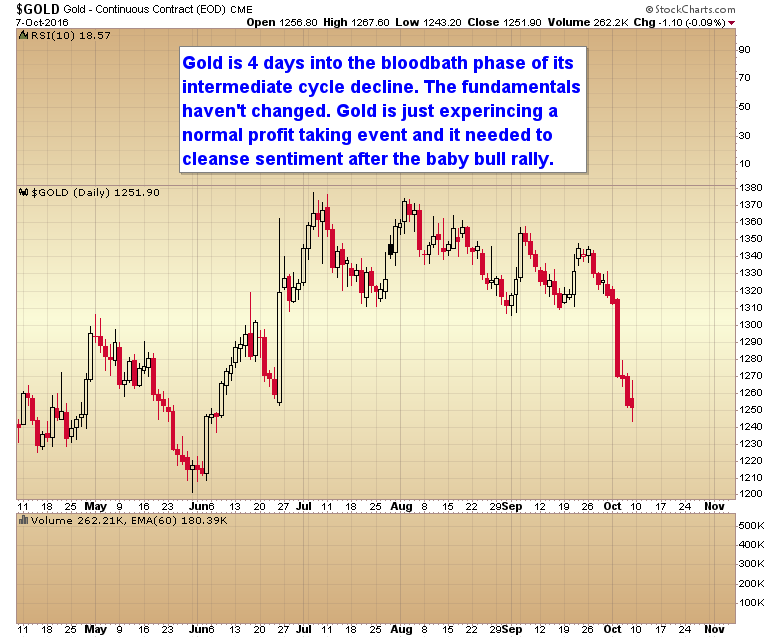 Once we have a confirmed bottom then gold will continue its A-wave advance. A-waves tend to be quite explosive and can test the previous C-wave top but don’t usually make new highs. 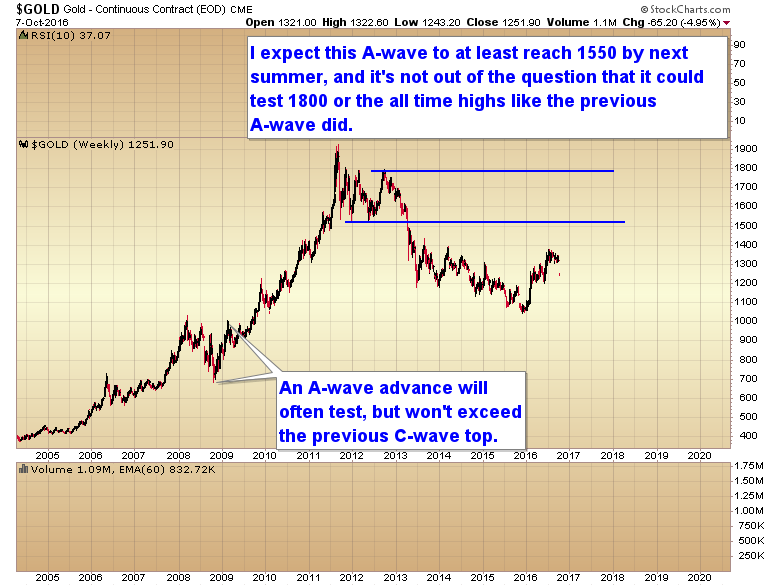 I’m going to take a guess and say this A-wave will at least reach 1550 before topping and it may even come close to testing the all-time highs as the dollar is due for a 3 year cycle low next summer. Don’t let the correction knock you out of your positions, or prevent you from buying the dip. This is a bull market, and bull markets naturally experience corrections. This entry was posted in Uncategorized on October 9, 2016 by Gary. I followed your work since sevreal month, and have to admit that you were right on this call. But about the yearly cycle low, I read several other analysts claiming current time frame is too soon for Yearly low. Thanks for finally mentioning the YCL! Though you still need to credit me for predicting gold & miners would crash the 200 day SMA party, a couple of weeks ago, well before the big drop. Thanks, too, for finally addressing the left translated ICL. Surf, Alex, and I disagree with you, but at least people know where you stand. Currently, we have two IC’s up, and now working IC #1down. There may be 1 or 2 IC’s down before resumption of upward price movement. A left translated ICL strikes me as foreshadowing there could very well be 2, before the current YCL completes. Therefore, to tell people to just buy anytime & wait for rescue encourages unnecessary risk-taking — that’s why I’ve been posting more than usual of late. For example, if people buy NUGT, or some other leveraged instrument, and either (1) the correction moves down by an additional unexpected DC/IC; or (2) corrections or moves up get embroiled in drawn out triangles or other sideways consolidations; then the rescue may be too little too late. There are ways to buy both long and short that remove some or all of that risk . For example, the way you traded the metals in the first two IC’s this year. To buy any ol’ time you feel like it and wait, on the other hand, is a MUCH riskier proposition. It is quite possible, if not likely, that 1921 & 1046 will BOTH hold, well into the 2020’s. Be wary of Autumns of Leap Years, as they seem to not go as well as other times for you (I have no idea what you were up to in Autumn of ’08 or before, but ’12 & ’16 have both delivered surprising blows to you). If one doesn’t want any risk then just stay in cash. It’s that simple. You don’t need to pay your broker commissions on two positions just so you can stay neutral. If you think it’s a bull market then buy. If you don’t think it’s a bull market then trade something else. One is never going to get rich hedging every position just in case you might be wrong. One can get rich by buying early in a bull market and hanging on. This is the very beginning of a 4-5 year bubble phase, it’s time to put the pedal to the metal IMO. Gary, much thanks for the update and very appreciated. The situation in Syria seems to be incredibly intense right now. It seems Obama and the Pentagon want to strike and take on Russia & Syria this month before the election. Would gold violently rise on such military action like this because so far geopolitical & military events so far have not thrust gold upwards. You have suggested one alternative to your old turkey strategy, with which I also disagree, as it makes one susceptible to another thing we Economists hate (in addition to undue risk): Opportunity costs — for example, staying in cash and missing out on an opportunity to deploy that cash for a positive, potentially lucrative ROI. There are other alternatives, such as trading DC’s and/or IC’s as you did earlier this year. That was the correct strategy from a risk/reward standpoint, and it still is — regardless which way the IC or DC is going (up or down). We can see how this turns out twixt now and, say, 2030. One thing I have observed living in different places around the world is, people have a tendency to think that whatever market they are participating in is a bull market — not just financial markets, but ALL markets: Real Estate, construction, the labor market, craft markets, street markets, retail, financial markets and more — ALL markets. The short, sharp correction is painful to them, but they usually get over it and move on (except anybody who jumped to their death in 1929, of course). The market that destroys individuals, families, and businesses large and small is the multi-year or multi-decade sideways correction. People long for a return to “the good ol’ days”, back when the money was free-flowing, hanging low from trees, a dart’s throw on the WSJ… they end up making risky decisions, instead of prudent ones. I recently reconstructed a conversation I had with my grandma’s aunt in 1980 — I was 12. She showed me her books with her stock holdings — accumulation of the bluest of blue chips from the late 1940’s thru mid 1960’s, then her shift into utilities later on. She had her utilities holdings such that she got a dividend check every 15 days. I was fascinated by what I saw, though I didn’t understand it then as I do now. My great great aunt was a hair dresser, by the way — certainly not an heiress. She created her own fortune. That’s one example of a correct strategy during a long, sideways correction (the stock market bear, 1966-1981): Shift from non-performing growth assets into stable, dividend paying assets. Aunt Hannah didn’t just go to cash during that prolonged sideways bear market — she changed her strategy, and lived out a comfortable retirement as a direct result, instead of facing the anxiety of watching her wealth wither away long after her income-producing years were over. But she was always invested, until the day she died. On the other hand, I have a friend who’s a real estate developer in a rural area of the US. He keeps right on behaving as though the bull market has returned or is on the verge of returning to housing — but the sales aren’t there to back him up, creating financial hardship for him & his family, just as he was hoping to make his way to retirement. Unlike my great great aunt, he’s simply unable to change his bull market strategy, and that has postponed his retirement indefinitely. You do realize opportunity risk is a meaningless term. It never exists in real time. In real time it’s impossible to know if you are going to miss a move somewhere else. Opportunity risk only exists in hindsight and unfortunately none of us ever get to trade in hindsight even though many like to pretend they do. Many, or should I say most of you missed the opportunity during the baby bull. We didn’t. Should I beat up on all those that blew it coming out of the bear market bottom because they were too timid to take a risk? How can many people buy or upgrade to a new house, or buy a new or newer used car when their health insurance premiums are increasing 30-50% every year? Miners generated a Bollinger band crash signal this week. If the bottom didn’t come on Friday I expect it will come by Wednesday of this week. Gary — thanks for this update. Question: what factors convince you that this correction in gold is the yearly cycle low? The intensity of the correction. Also the YCL last year occurred in this time frame. Funny that you should mention the 200ma. I think me and a few others were brought it up some time back and you were quite dismissive of the possibility :). I think the 2002 pattern looks like the best analogy. HUI started 2002 at 65 went to 155 for a 140% approximate gain and then went down to about 95 before bottoming. Wiping out about 2/3rd of the points. In 2016 we started at about 115. Went to about 280 for about a 140% increase. If we wipe out 2/3rd of the point gains, we should bottom around 172 on the HUI, about 14% lower from here. Mike Trike, to be concise, I meant that STOCKS ARE ALREADY IN YEARLY CYCLE DECLINE, IF STOCKS ARE WORTH BEING INTO THAN THAT SHOULD ONLY BE ON THE SHORT SIDE. Dreadful moments lie ahead for stocks, the bull though remains intact, but a steep decline is round the corner. I am considering opening a short SPX position for a maximum risk of -1% of my equity on Monday. ….as to gold/miners, they should start surging into a new daily cycle but…due stocks’ feeble position I rather being mostly in cash, with the only exposure to be only the short SPX I told about above. – stocks are extremely vulnerable, gravitation is unavoidable now for them. Even if USX would continue its decline until Wednesday, crude oil is worth shorting indeed. Regarding Gold and the Miners, this may very be the ICL forming. As I have May 31st as the last ICL, however, it is still possible from a Time perspective to have one more failed Trading or Daily Cycle in to late Oct or mid-Nov that takes Gold down to the 1200-1220 level and GDX to the 19-20 level.